Flowers white, usually with either stamens or pistils stunted, the functional males and females on separate plants; 5 petals ¾” long [2 cm] on male flowers (first photo), scarcely ½” [12 mm] and broader on female flowers (second photo); 5 sticky-hairy lanceolate calyx lobes; leaves alternate, mostly ternate, often persistent but not thick nor truly evergreen; leaflets 1–3″ long [3–8 cm], elliptical, pointed, with fine teeth upon coarse teeth; flowering stalks rising up to 12″ tall [3 dm] from long slender trailing stems with many slender thorns, these long stems living for two years, producing branches, flowers, and fruit only in the second year; tips of the long stems take root. Habitat: Widespread in clearings and more or less sunny forest; WA, OR, ID, BC. 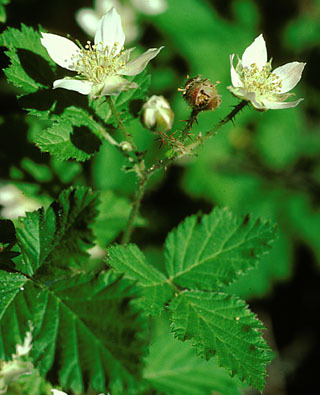 Similar: The non-native weedy Himalayan Blackberry, with bisexual flowers on all individuals, is much taller and more robust. 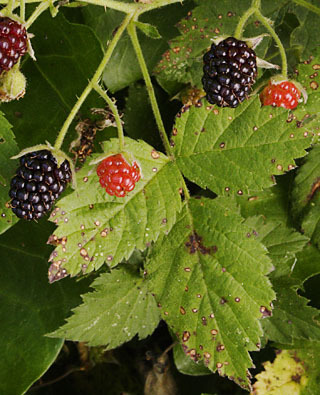 Natural History: The Northwest famously grows mouthwatering blackberries like weeds. The most eaten ones are weeds—serious nuisances, exotic, invasive, archetypal briarpatch—but mouthwatering all the same. The Pacific “wild” blackberry, our only native blackberry, is not sweeter but is more elegant, distinctively firm-textured, long and fine-grained. Though dwarfed and outnumbered by exotic blackberries in towns, it is the abundant species of lower mountain slope forests. 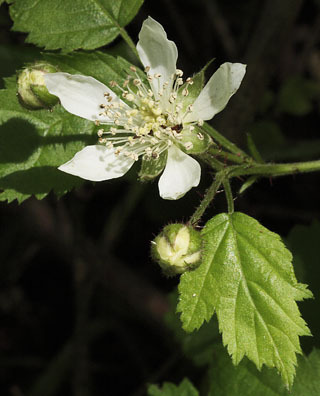 It is the chief parent species of the cultivated marionberry, and is recommended for further use in breeding commercial berries due to its high levels of antioxidants.